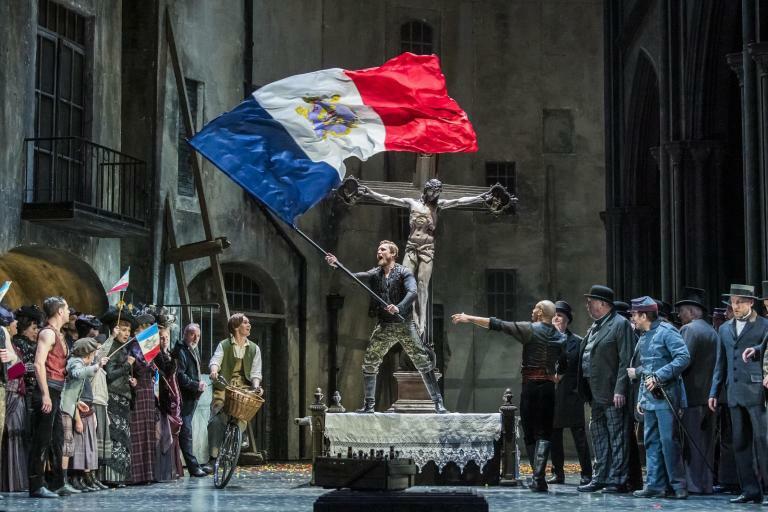 An early reviewer of this opera, Henryk Opieński, wrote: ‘The libretto of King Roger is a dramatic poem in which there is no romance, no love duet, no killing, no duel, in a word, none of those factors which are allegedly essential for an operatic ‘plot’. The content, distributed over three acts, is the victory of the Dionysian idea of life over a king who is imprisoned by the chains of Byzantine religious rigour, his wife, his entourage and, lastly, the whole of his people’. Moreover, the general impression of the work is more that of an oratorio, or maybe a mystery play, than a genuine opera. Musically it is also a patchwork of Greek-Orthodox church music (the choruses in the opening scene), Oriental influences (Roxana’s aria) and Szymanowski’s late modernism, where he has left behind his original models: Chopin, later supplanted by Wagner, Reger and Richard Strauss, after 1914 impulses from his travels to Italy and North Africa, even later French impressionism, Stravinsky and Polish folklore. Altogether he created his very own tonal world as a conglomerate of all this – and his own ideas. It is indeed easy to agree with Polish baritone Mariusz Kwiecień, one of today’s foremost exponents of the title role, who said in an interview before the premiere of King Roger at Covent Garden: ‘to have composed this music one must have done drugs or at least been a little mad’. Digesting his particular brew isn’t easy at a first, but repeated listening pays dividends, and in combination with imaginative and beautiful production and involved singing and acting, even those unfamiliar with the idiom can enjoy a deep overall experience. As can be seen from the production details above, the production team is all-Polish, since this is a co-production with Teatr Wielki in Warsaw (the stage where the world premiere took place in 1926) where the present production premiered on 2 December 2018 with, I presume, the same principal cast. And it is indeed a closely knit ensemble, with two native Polish speakers in the central roles of King Roger and the Shepherd. My knowledge of Polish is close to nil but it seems to me that the other soloists also manage the language well. Łukasz Goliński and Arnold Rutkowski are utterly expressive, both vocally and scenically and they carry the performance very convincingly. But the vocally most attractive – in particular for the ‘traditional’ opera-goer, who wants arias – is Elin Rombo as Roxana. The part was sung at the world premiere by Szymanowski’s sister, and one imagines that he was fond of her and wanted her to have the most loveable music. Elin Rombo, a Royal Court Singer since 2013, was in marvellous voice during the first two acts – less so in the final act. But this production is not designed for savouring juicy favourite arias, rather it offers mystery, a dreamlike, otherworldly atmosphere, sets with especially evocative lighting design and video projections – and not least a musical score that – mad or not – grabs you by the throat and never lets go until the curtain is finally down. Opera or not, it is drama – internal – on the highest level. It was a brave decision on the part of the management to introduce this work to the Swedish public, 93 years after its premiere, and none too soon, considering that the composer’s mother was Swedish. A big bunch of roses to all involved for this overwhelming experience.